In 1941 Science discovered a source of unlimited energy. Science called him miraculous, but his parents called him Claude. Before his discovery he was known simply as Claude "the Tireless." Never angry at anyone but himself, he was perpetually in action—Boat Club, the Log, Rifle Squad, photography; always ready to sing, to laugh, or to give a lift. To the casual observer, he was a ladies' man. Actually, he was one woman's man. Someday, somewhere, when the seas are heavy, and the word is "Enemy Sighted," someone will be amazed at Claude—confident, calm, defiant and determined, all that he should be—and more. My father, Claude W. Adams, Jr., USN, was born in San Diego, CA on October 20, 1919, to Claude W. Adams, Sr., and Mabel Rorabaugh Adams. His father was in the Navy at the time. He was raised in Colorado, near Canon City, but moved later to Spokane, Washington, at age 10, after the death of his mother, attending Central High School, graduating at age 17 in 1937. He joined the Navy, after getting his father to sign for permission, and eventually got on board a ship which had a library. By studying diligently any time he wasn't on duty, he was able to take the competitive exam for the U.S. Naval Academy at Annapolis, to which he was appointed in 1939 as a member of the class of 1943. While he was there, he was Editor-in-Chief of The Log magazine. Wartime acceleration meant he graduated in 1942. The first couple under a new law, my father and mother (Jeanne Cassels) were allowed to get married upon graduation, rather than waiting the usual four years. They had met in high school in Spokane, and kept up a long-distance letter-writing romance for five years. If that law or regulation hadn't been changed, I would not have been born. My sister was born in April of 1943 in New York City; I was born in May of 1945 at Naval Air Station Banana River in Florida (now part of the Cape Canaveral complex). In late May of that year, we traveled to Hayward, California by car at a wartime gas-saving speed of 35 mph. My father's next duty was to Japan, where he flew patrols in a PBM, Martin Mariner (large seaplane). I last saw him when I was three months old, I've been told. About three weeks after the end of WWII, he was flying patrol over Sakhalin Island, then Japanese territory, when three Russian fighters pounced on his plane, shooting at him. His crew wanted to fire back, since the plane was still armed at the time. His comment: "Do you want to start World War III?" He kept them from firing back but flew his plane just above the waves, where the fighters could not go and couldn't reliably dive to shoot at him. Upon return, he was court-martialed for flying a seaplane over land, overflying foreign territory, and offending the Russians. His appointed lawyer refused to take this "hopeless" case so he defended himself and was acquitted, using logic, and noting that only one ambassador at the time knew Russia had claimed the island, and he had not been given a briefing before going on routine patrol. The Russian press was livid that he'd "gotten off" and it was decided a "change of venue" was best for all. He was assigned to the Philippines. 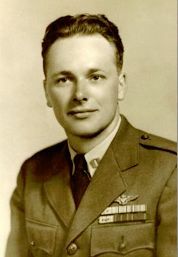 In July of 1946, he was participating in an air-rescue operation to find some Army pilots who had crashed on or near Mt. Halcon, on Mindoro Island, in the Philippines. Why a seaplane? Huge wings with lots of fuel meant the plane could stay aloft for many hours and fly slowly too. There was a typhoon in the area at the time. It is thought that his plane crashed on that mountain on July 28, 1946, killing all 11 aboard. From what I have heard, the pieces of the wreck were small, as if the plane had exploded, but did not burn (so the cause wasn't the fuel). The wreck of the army aircraft was also later found about 100 yards from his wreckage. The Mt. Halcon trail is closed now because the rugged terrain has killed far too many hikers. In 1946, remains were recovered by the army but in a condition that meant that all 11 crew members were buried in one common grave at Jefferson Barracks in Missouri. My mother, sister, and I were at a military air field to fly to the Philippines on July 28, 1946 when we received word that he was "missing" and told not to come. I was 15 months old at the time and that is my earliest memory. I, of course, didn't know what was going on but everyone around me was crying and really upset. That made an impression even on an infant. The last image I have is the plane we were supposed to be on, taking off without us. I can see the tail in my mind and now identify it as the military version of a DC-3. It was over two weeks later, August 14, 1946, that we got The Telegram confirming his death. My mother never remarried, and the life of a widow with two young children in the 1950s was not one of plenty, to say the least, as most AWON members can confirm. My sister and I had love from our mother and my sister says she remembers riding on our father's shoulders once when he was on leave. From all we were told, Lt. Claude W. Adams, Jr., USN was a fine young man who died at age 26. His mother had also died at age 26. My sister and I both felt relief to celebrate our 27th birthdays. Our mother died of a brain aneurysm in 1977, at almost 57, just as my son was being born. I never knew my father. My children have never known their grandfather or grandmother. We have stories that portray our father who never came back from World War II as a good person of character. But that's it. What's having a father like? What advice would a father give his son or daughter? How would we have learned to deal with the world with TWO parents? It took me seven years to work my way through college with part-time jobs. My sister never completed her degree. How would our lives have been richer and fuller than what they were with more than just a "good story" and a photograph of a handsome young man on the wall instead of a real person? It is July 28th. Every day I sit at my computer to write; about science, about history, about whatever crosses my mind. I love to write. But today I write to honor my father, and I am having trouble. My father was Lt. Claude W. Adams Jr., USN, a man I never knew. From what I have been able to learn, he died on this day, 66 years ago, trying to save lives. He had grown up in a poor family but was bright and wanted an education, an education there was no way to afford in the Depression years of the 1930s. His father served in the navy during World War I, so my father enlisted at the age of 17 in 1938, having graduated from high school early in Spokane, Washington. He was able to transfer to a ship with a library where he could study for the competitive examination for the U.S. Naval Academy at Annapolis. He was successful, with a high enough score to get an appointment. He was in the Class of 1943 that had to graduate in 1942 by compressing the summers, to fill the needs of World War II. My mother and father were high school sweethearts and they maintained their love through letters over the three years of his studies. Besides the letters, he was also editor-in-chief of The Log, the Academy’s magazine. I learned to type on his old typewriter that we still had at home. He was a good writer. It had been a regulation that a graduate of an academy could not get married until four years, I believe, after graduation. But a special allowance was made for wartime exigencies, and my parents’ picture appeared on the front page of The Washington Post as the first couple to marry at the Naval Academy chapel in 1942. My sister and I are the beneficiaries of that dispensation, since she was born in 1943 and I in 1945. By this day in 1946 - the earliest date they could have married before the allowances were granted - he was dead at the age of 26. I don’t know very many of the details. My father joined naval aviation after some time in surface ships, since he felt the way of the future in the modern Navy was either above or below the water. He did not become a fighter pilot or a bomber flier. Instead, he flew the large four-engine PBM Martin Mariner amphibious planes, used for reconnaissance and rescue. Some called the PBM - larger than the PBY Catalinas you still see from time to time in movies and out-of-the-way remote locations “The Flying Gas Tank,” since it could carry a huge load of fuel to allow for extended searches far from airfields or resupply. When you needed to search a large area of land or sea, you called for the PBMs. When “Flight 19,” the torpedo bombers of The Bermuda Triangle that disappeared on December 5, 1945, needed to be found, a PBM Mariner from NAS Banana River went out to search and found an oil slick before it, too, disappeared. I was born at NAS Banana River seven months before that, on May 4, 1945. In July 1946, some Army fliers disappeared someplace on Mindoro Island, the Philippines. My father, with his 13-man crew, went to look, ending up near Mt. Halcon, a treacherous mountain with fierce trails. Mt. Halcon is the site of many modern climbing accidents, and currently is closed to hiking and climbing because of its lethality. From what I can gather, the Army flight was reported missing on July 26 and my father’s plane crashed sometime on July 28, 1946. A flash from the base of the mountain was seen from far away on that date, and a search party on foot finally came across the wreckage. The plane was in small pieces but had not burned. There were no identifiable remains, so all 13 men were buried in a common grave at Jefferson Barracks National Cemetery in Missouri, a location equally far away from all the families and close to none. He is buried in Missouri. Some other details of the crash are at VP Navy. Claude is one of 81 members of the Class of 1943 on Virtual Memorial Hall.